Back when this was written, over 20 years ago, this book really stood out, since there really was only one other book out there that came anywhere close to the quality of poker advice it offered, and that was Sklansky’s Theory of Poker. So this book looked to take some of the concepts within the previous work and focus on their application to hold’em specifically. While The Theory Of Poker is still considered by many, including myself, to be the best poker book of all time, Hold’em Poker For Advanced Players is nowhere near as good, although having said that, it’s still an excellent book and one that should be on the reading list of every poker player. “Hold’em” by the way means limit hold’em, as that was the game of the day. So unfortunately it doesn’t speak to the overwhelming favorite variation of today, which is of course no limit hold’em, in spite of the book being updated a few years ago to the “21st century edition.” With that said though, it is still one of the best poker books out there period, and much of the material that it teaches is applicable to no limit hold’em as well. 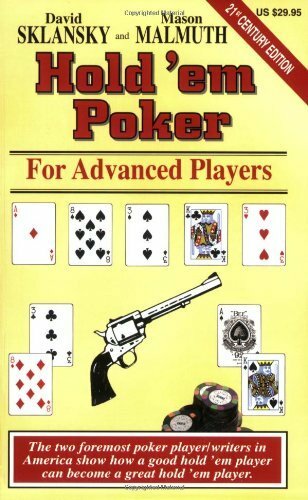 This classic was way ahead of its time when it was written and still stands out after all these years as one of the better poker books out there. I wouldn’t hesitate in recommending it to anyone who hasn’t read it yet.